Governor Vajubhai Vala met the BJP and the Janata Dal Secular separately after Karnataka election results. It is up to him to decide who will get the first shot at proving their strength in the house. 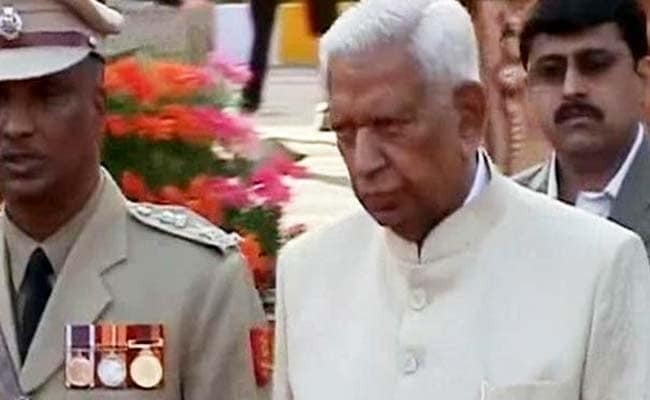 Karnataka Election Results: Governor Vajubhai Vala is a former member of BJP's ideological mentor, RSS. As election results plunged Karnataka into a Game of Thrones, the man who is set to make the most important decision is Governor Vajubhai Vala, a Gujarat veteran. Vajubhai Vala, 80, was appointed governor of Karnataka in 2014, months after the BJP came to power. This afternoon, there was complete chaos outside his official home on Bengaluru's Raj Bhavan road, as two sets of visitors called on him with claims to power - the BJP's BS Yeddyurappa and the Congress-Janata Dal Secular combine. The governor has two options in case of a hung assembly - he can invite the coalition that has a majority, or he can invite the single largest party, which is the BJP, and ask it to prove its majority. While Mr Yeddyurappa says he should be given first shot, Congress leaders argue that this was not the case in states like Goa and Manipur, where the Congress turned out to be the single largest party but could not form the government. It is now up to the Governor. Mr Vala has been BJP president twice. He vacated his assembly seat Rajkot West when PM Modi contested his first election in Gujarat in 2001. Mr Vala had won seven elections from the seat, which was considered among the party's safest. He got it back when in the 2002 assembly polls, PM Modi moved to contest from the Maninagar seat. When PM Modi was chief minister in Gujarat, Mr Vala was finance minister and his number two for10 years and also presented the state budget 18 times. He was also speaker of the Gujarat assembly. Mr Vala joined the Rashtriya Swayamsevak Sangh or RSS, the BJP's ideological mentor, when he was in school in his hometown Rajkot. He joined the BJP's predecessor Jana Sangh and soon grew close to Keshubhai Patel, a powerful Gujarat BJP leader who became the state's Chief Minister in 1995. Mr Vala was considered a crisis manager in the Gujarat BJP and was made party chief after the rebellion by Shankarsinh Vaghela, which resulted in the fall of Keshubhai Patel government. As mayor in the 1980s, when Rajkot faced a severe water crisis, Mr Vala famously arranged to bring water by train to the city, a first in those years. He became famous as "paniwala mayor". During the Emergency of 1975, he was jailed in Sabarmati for 11 months.